ROYAUME UNI – Maryport - A complete Roman altar, the first to be uncovered since 1870, has been found on Camp Farm in Maryport. The altar discovered this week was to the god Jupiter and was inscribed on behalf of Attius Tutor from the First Cohort of Baetasian, from the lowlands of Holland. This Roman cohort moved from here to Kent and appeared to be specialists in coastal defence. The altar is the fourth by Attius Tutor to be found, and three others form part of the Senhouse collection, unearthed in 1870. There are two other collections of four altars by the same people at the museum – one for Marcus Maenius Agrippa and one for Gaius Caballius Priscus. PORTUGAL – Perdigões - About 20 ivory statuettes estimated to be around 4,500 years old have been discovered in an archaeological dig in eastern Portugal, a first in the country, archaeologist António Valério said this week. "This is the first time pieces with such characteristics have appeared in Portugal", Valério told Lusa News Agency, adding that similar finds had been made earlier in southern Spain. He said the statuettes appeared to be funeral objects as they were discovered in an area of the Perdigões archaeological complex which had been used for cremations between the late Neolithic and early Bronze Age. He dated the pieces to the middle of the third millennium BC, making them some 4,500 years old. FRANCE – - Noyal-Châtillon sur Seiche - 15 000 sites archéologiques sont recensés en Bretagne, dont celui de Noyal-Châtillon. On y a mis au jour une des plus grandes villas gallo-romaines de la région. « On a mis au jour trois programmes d'installations thermales successives, ce qui prouve l'appartenance de cette villa à un riche propriétaire foncier, qui devait avoir sa résidence principale à Condate (Rennes), une famille qui comptait dans le microcosme rennais antique », raconte Romuald Ferrette, archéologue responsable de l'opération. Les fouilles, pour lesquelles pas moins de treize archéologues de l'Inrap auront été mobilisés, ont commencé fin mars et s'achèveront en septembre. Elles auront permis d'en savoir un peu plus sur ce qui fut l'une des plus importantes villas gallo-romaines de Bretagne, dite de La Guyomerais, et dont l'aile Est fut révélée lors de fouilles effectuées de 1983 à 1987 par Alain Provost, archéologue indépendant. Une villa dont l'histoire s'écrit sur quatre siècles et demi d'occupation et près de 4 000 m 2 . « Une première grande résidence y fut construite au premier siècle après Jésus-Christ, complétée au fil des siècles et aboutissant au III e siècle à un grand plan en forme de U, ayant en son coeur un bassin d'agrément », poursuit Romuald Ferrette. Les dernières fouilles ont révélé un ensemble de trois thermes successifs, dont le plus important fut aménagé au II e siècle sur 200 m 2 . Divers objets ont également été retrouvés sur le site, comme une bague en argent, deux fibules (agrafes servant à fixer les extrémités d'un vêtement), une pince à épiler, des fragments de mosaïque en pâte de verre, des pièces de monnaie de différentes époques, mais encore une pelle en alliage cuivreux et son manche rétractable, ainsi qu'une petite coupelle en argent ouvragé. 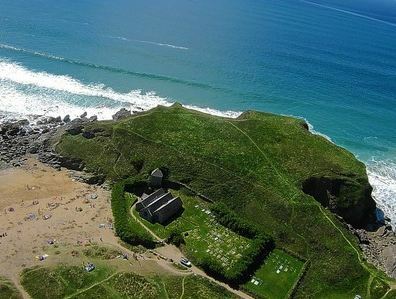 ROYAUME UNI – Gunwalloe - New discoveries made during an archaeological dig at Gunwalloe's cliff castle are being revealed during an open day taking place at Gunwalloe Church Cove this weekend. Dr Imogen Wood is leading the project, called Unlocking Our Coastal Heritage. "The promontory fort or cliff castle at Gunwalloe has captured people's imagination for hundreds of years but has never been investigated," she said. "It's under threat from coastal erosion as every winter storm eats away at the cliffs, making it a race against time to record it and discover its secrets. "This year's work is of great importance to Cornish archaeology, as despite there being over 60 known promontory forts along the Cornish coastline, relatively little is known about them. "They're thought to date from the Iron Age period, from around 500BC into the Roman period," she said. "Various suggestions as to their use exist, including for defence against other tribes, settlement, centres of religious worship or trading centres." USA - Lillian Joyce Quarry site - A Minnesota archaeologist may have found proof of human life in the Superior National Forest more than 10,000 years ago. n 2009, a team of archaeologists and students, including Dr. Mark Muniz of SCSU, who secured the MHS grant, ventured into a remote area of northeastern Lake County near Knife Lake, 15 miles from the nearest road. Before 2005, the area, now called the Lillian Joyce Quarry site, was inaccessible and virtually invisible. In 1999, a storm downed hundreds of trees and Superior National Forest officials conducted a prescribed burn of the area in 2005. So what did they find under the blowdown area? “Faces of high-quality metamorphosed Knife Lake Siltstone that exhibited ample evidence of quarry activity,” wrote Lee Johnson, Superior National Forest archaeologist, in the 2010 Minnesota Archaeologist Society Newsletter. “The survey also resulted in the identification of numerous workshop areas scattered throughout the study area, some of which are located up to a ¼ mile from present day shorelines.” In simpler terms, that means evidence of ancient human inhabitation and work areas. “Some sites had been found in Canada, so we expected to find a site [on the U.S side of the lake], but we didn’t expect it to be so well-preserved. We had the opportunity to do a walk-over survey and see evidence of people being there, which is very rare,” Johnson, who oversees 2.5 million acres of Superior National Forest, told the News-Chronicle. In 2010, charcoal samples were collected from the site. Muniz will use the MHS grant funding to send them to a lab for dating. He said he hopes to have the results back some time before next summer. The technique that dates the charcoal, called AMS, should return results that are accurate to within 100 years, Johnson said. If Muniz’s hypothesis proves correct, Paleo-Indians were present in this area of Minnesota between 11-12,000 years ago, long before widely accepted timelines of habitation. To this point, it has been thought that the environment could not support human life so soon after the recession of glaciers, the researchers say. Samples of stone tools and stone fragments show that flintknapping techniques were used by inhabitants of the area to fashion needed implements from the 2.3 billion year old siltstone. Some of these artifacts were found in place as though the craftsman (or woman) had just stepped away for a caribou sandwich. “These sites were very well-preserved and we’re now looking for a habitation site near the quarry site,” Johnson said. He estimates that only about 10 percent of the site has been explored. A team will return to Lillian Joyce Quarry this fall.